United Nations Ambassador Nikki Haley Friday defended how long President Donald Trump is taking to decide on a potential military strike in Syria, saying she is "unbelievably proud" of how he has analyzed the situation and "not let anyone rush him into this." "If you rush decisions like this, you make a mistake," Haley said just before a UN Security Council meeting in New York on Friday. Haley highlighted "He [President Trump] has said from the beginning we have to know we're right, we have to know all the information, we have to know there's proof and we have to know that we're taking every precaution necessary should we take action," she said. Haley also said unequivocally "there is proof this happened" in regards to the chemical weapons attack. "Did a chemical weapons attack happen? Yes, the U.S. has analyzed, yes it has happened, the UK has analyzed, yes it has happened, France has analyzed, yes it has happened, three separate analysis all coming back with the same thing, there is proof this happened," Haley said. "I'm not going to say which day we absolutely knew there was proof, the attack took place on Saturday, we know for a fact it was a chemical weapon, we know that there are only certain countries, like Syria, that have delivery mechanisms and those types of weapons," Nauert said. "At some point, you have to do something. At some point, you have to say 'enough.' We saw what happened in Salisbury. This is a renewed effort to bring chemical weapons back into the mainstream and we can't allow it to happen," she said. The pair, who are often seen exchanging warm greetings and air kisses, delivered their remarks back-to-back Friday morning. Nebenzya reiterated Russia's usual claims that there is no credible confirmation the Douma chemical attack, which has killed at least 40 people according to activists and medics, was carried out by the Assad government and that the United States is ratcheting up "bellicose rhetoric." In response to Nebenzya, Haley said "I started to listen to my Russian friend and respond, but instead, I'm in awe, Vasily, of how you say what you say with a straight face. I really, really am." 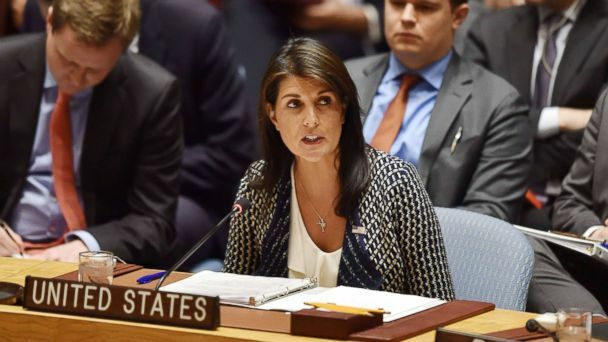 Haley continued the line of justification for potential strikes she began at the stakeout camera outside the meeting, saying inside "Our president has not yet made a decision about possible actions in Syria. But should the United States and our allies decide to act in Syria, it will be in defense of a principle on which we all agree, it will be in defense of a bedrock international norm that benefits all nations." "It is Russia alone that had agreed to be the guarantor of the removal of all chemical weapons in Syria. If Russia had lived up to its commitment, there would be no chemical weapons in Syria. And we would not be here today," Haley continued. "Russia can complain all at once about fake news. But no one is buying its lies and cover-ups."